Big sheds for big spaces, Garage World can custom build a large new shed or steel structure to suit your exact rural purpose and location. Built strong and built right to last a lifetime, our Australian made rural sheds withstand the demands of farm life and Australia's climate because they're built using the premium quality steel products and market leading, galvanised Morinda brackets and joints. No job is too big for Garage World. Our professionally engineered rural steel shed designs can be modified to any height or width and are compatible with roller doors, sliding doors, windows and more. We also have an extensive range of DIY farm shed kits and rural shed kits. Contact us today for more information. Our experienced rural shed building specialists can manage every aspect of your project. Each of our farm sheds for sale comes with initial free on-site consultation, through to site planning, permits and approvals to ensure you receive only high quality workmanship and on-time completion of a new farm shed, workshop, or rural barn that we will both be proud of. A good looking addition to any farm, acreage or larger residential property, our versatile range of heritage style farm sheds and barns improve the value of your estate and give you plenty of space to work, keep animals or store large valuable assets. Built strong and built right using premium quality Australian steel and patented Morinda Glove Bracket System, our two most common barns for sale - the Stockman and Stockman Pop-Top Barns- can be customised to suit your individual farming or residential requirements. Ideal to build on the acreage as a weekender or holiday home, our traditional style Stockman Barn is available in a variety of colours, heights and span widths making it one of our most popular and versatile steel buildings. The Stockman Pop-Top Barn also features strong flowing lines without the clutter of internal columns to give farmers, truckies, boaties and tradespeople more space to store large vehicles and machinery whilst still maintaining a traditional barn style look. 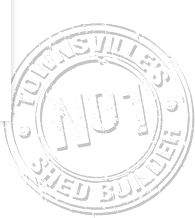 Come and see examples of some of the finest farm sheds Australia wide, and talk to the shed building professionals at Garage World Townsville. Alternatively, you can apply online now for a FREE quote.